Who needs flowers when you can surprise your love with 12 long stem Rosé (pun intended!) for Valentine’s Day. In the spirit of spreading love we’re gifting 12 bottles of Bendigo region Rosé to one lucky person to share with their love. Entries open until 12th February 2019. Winner announced on Instagram on 13th February 2019. Eligibility: This competition is only open to entrants aged 18 years of age or older as of the date of entry (proof of age required of winner). Must be a citizen of Australia and live in Australia to qualify. Agreement to Eligibility: By participating, the entrant agrees to be fully unconditionally bound by these Eligibility rules. Bendigo’s leafy Rosalind Park is the setting for this celebration of local wine and food. The Regional World’s Longest Lunch Bendigo is on Friday 15th March 2019. At a single long table stretching through the park’s picturesque boulevard of trees, guests will enjoy a six-course menu from the chefs at Wine Bank on View with a focus on regionally-sourced food. This will be accompanied by wines from Bendigo wineries that have been selected by a panel of local sommeliers and wine buyers, some of whom will be on hand to discuss the wine strengths of the region. On 15th March we’ll be bringing wine and food to the park said Bendigo Winegrowers Association President Wes Vine. “There really is no better way to experience Bendigo than an edible escape to Regional World’s Longest Lunch Bendigo,” said Vine. Presented by the Bendigo Winegrowers Association and Wine Bank on View, guests can expect a relaxing afternoon at the gorgeous long table that stretches along the grand boulevard of Rosalind Park. Tickets are on sale now from Wine Bank on View (03 5444 4655) or online from Melbourne Food and Wine. Tickets are $145 per person. Regional World’s Longest Lunch Bendigo is part of Melbourne Food and Wine Festival presented by Bank of Melbourne. Thanks to local lunch sponsor Robertson Hyetts Solicitors. 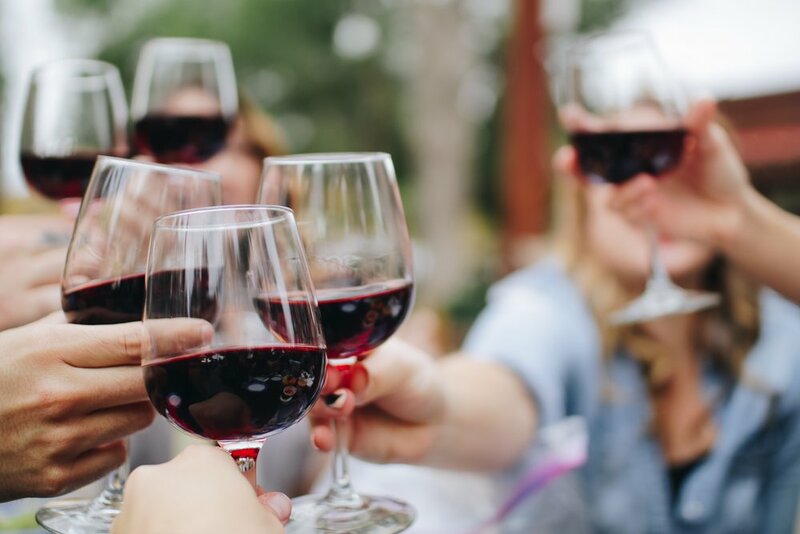 Red wines are commonly associated with winter nights and fireplaces, but we believe that a glass of red in summer is just what you need with a delicious picnic or lunch in the sun. We’ve taken it upon ourselves to let you know that it’s OK to drink your red wines chilled. Here are a few of our tips. The ideal temperature for serving red wine is actually 14-18 degrees. The cooler temperature can help tame the alcohol in higher percentage alcohol wines. It’s completely OK to chill your wines all the way down to 14 degrees to refresh you this summer. We all know that red wine pairs well with red meat. While thick, juicy steaks and slow-cooked lamb shanks are the winter comfort foods we all crave, we suggest pairing your chilled reds with something lighter in summer. Pair with pâté, cheese and biscuits or grilled tuna. We suggest chilling your red wine in the fridge for 30-45 minutes before serving to reach optimum summer chill. Never place it in the freezer! Once opened, it’s a good idea to decant the wine to give it some room to breathe before enjoying. Ultimately, it’s about your personal preference. We believe that while wine may benefit from certain treatment, it’s best served just the way you like it. A raffle conducted on the day raised $905 for the New Bendigo Hospital Fundraising Appeal. The Appeal is raising much needed funds for new medical equipment for Bendigo Hospital. It's that time of year where you'll find winemakers out in the vineyard harvesting the grapes. Vintage 2018 is currently in full swing in the Bendigo wine region. Australia Day long weekend we have a long list of wineries open for your tastebuds and you. Sit and enjoy the warm weather, wine and the chance to chat to the winemaker. We hope you've enjoyed a good dose of Christmas Cheer this holiday season. Thanks for attending our events this year, visiting our cellar doors, and enjoying our wine. At the 2017 Ballarat Wine Show the Lome 2015 Shiraz won three trophies. Champion of the Show, Best Regional Red Wine and Best Regional Shiraz. Tim and Di from Lome could hardly contain their excitement with their triple win. The inaugural Bendigo Uncorked Week drew to a close on 15th October with rave reviews and happy patrons. From 6th to 15th October 2017 more than 1,100 wine and food lovers immersed themselves in a range of events run by the Bendigo Winegrowers Association in partnership with iconic restaurants across the city. The 2015 Burnt Acre Shiraz was the clear winner of Bendigo’s Best Shiraz competition – The People’s Choice. Members of the public blind-tasted the full suite of Shiraz at Wine Bank on View during Bendigo Uncorked Week. Burnt Acre Winemaker Cliff Stubbs said that winning Bendigo's Best Shiraz was very rewarding. Social media bloggers Cellar Door Score came for a visit to the Bendigo Wine Region in September and left satisfied, wine in hand and bellies full. Read on for what they had to say about the Bendigo Wine Region. Congratulations Harcourt Valley Vineyard and Glenwillow Wines, both awarded at the Melbourne Wine Competition 2017.